When the Japanese attack on Pearl Harbor plunged the United States into war on 7 December 1941, the introduction of security forces into Northeast Brazil seemed to the United States Army more important than ever. The object of its grave concern was not the position of the Brazilian Government toward the war, but the new air bases in northern Brazil, which were virtually undefended. President Vargas at once pledged that Brazil would associate itself with the war effort of the United States, though he cautioned that this did not mean that Brazil had any immediate intention of declaring war on or even of breaking diplomatic relations with Japan. After the exchange of war declarations between the United States, Germany, and Italy on 11 December, Brazil began to curb German, Italian, and Japanese activities by such measures as freezing credits, closing Axis news agencies, and suspending the German controlled CONDOR airline. These measures did little to protect Northeast Brazil. 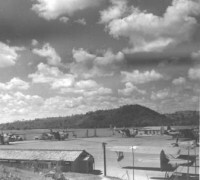 The Brazilian ground and air forces then stationed in the Northeast were not prepared in terms of either equipment or training to deal with an attack by modern combat forces, and the United States Navy patrol forces based there were neither adequate nor suitable for defense of land air bases. To the United States Army, it appeared that only American ground and air forces could be depended upon to protect the string of vital airfields extending from the Guianas to Natal against sabotage or external attack. 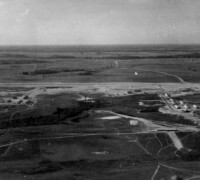 The Army had planned the airfields in 1940 solely as a hemisphere defense measure. 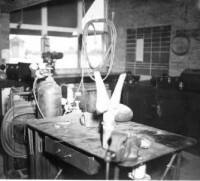 Then, as construction progressed and the fields became partially usable in the latter half of 1941, they began to serve a new purpose-they became essential links in the South Atlantic airway, over which airplanes were being ferried and high-priority materials transported to British forces in Africa and the Middle East. When Japan's attack cut the transpacific air routes and the North Atlantic route virtually closed down for the winter, the South Atlantic route suddenly became the sole remaining airway from the United States to the fighting forces in the Old World. Immediately after Pearl Harbor the United States Army began to plan the flight of heavy bombers by way of the South Atlantic to the beleaguered American forces in the Philippines. When the United States and Great Britain got together at the ARCADIA Conference to plan their conduct of the war, guarding the South Atlantic airway was one of their most pressing concerns, the Anglo-American agreement of 31 December on grand strategy designating it as the most-important of the air routes between the hemispheres. 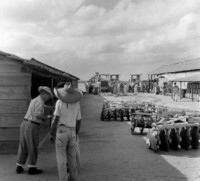 Beyond this attention focused on the airway as a critically important ferrying and supply route, the United States Army for several months after Pearl Harbor continued to view the defenselessness of airfields in Northeast Brazil as a menace to hemisphere security that could easily be corrected by stationing United States security forces there with Brazil's consent. Without such protection it looked to the Army as if the Brazilian airfields invited a German air advance across the South Atlantic from Africa, aimed toward the Caribbean Sea and the Panama Canal.